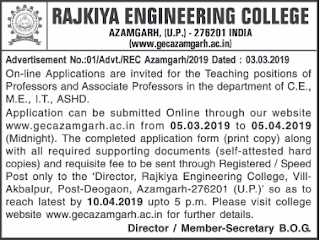 candidates can apply Online for Azamgarh Rajkiya Engineering College Professor, Associate Professor Jobs. 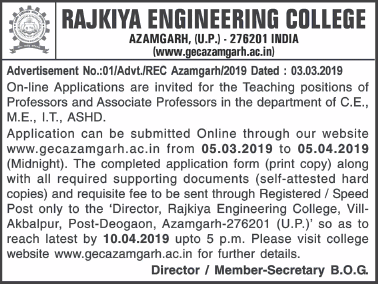 Eligible candidates can refer www.gecazamgarh.ac.in/ Official website for Azamgarh Rajkiya Engineering College Professor, Associate Professor Vacancies. Required Details like Salary, Important dates, selection Process, Qualification are given below. Starting Date to apply: 05-03-2019. Ending Date to apply: 05-04-2019. Eligible candidates Application can be submitted Online in Official website www.gecazamgarh.ac.in/ from 05.03.2019 to 05.04.2019. The completed application form take the print out copy along with all Educational documents to be sent through Registered / Speed Post only to the Given Postal address are maintained below. Last date to apply 05-04-2019.